The days of easy growth are winding down as agencies encounter new challenges such as in-housing, large new entrants, and a shift in billing preferences. We conducted research with digital agency owners and combined our findings with other trusted sources. This report highlights the key themes driving the industry and attempts to provide a clear picture of how the digital marketing agency landscape is evolving by detailing the major concerns and opportunities present in the industry. The agency landscape is changing rapidly but new avenues for success are becoming available. If you’re like most agency managers you’ve probably noticed the agency landscape changing more quickly over the last few years. In the early 2010s it seemed almost easy to build a successful agency. Adwords, and Facebook ads let you target your client’s prospects like never before. Designing for the internet and smartphones was a new frontier that let you differentiate your client’s brands in an entirely new way. Inbound marketing was all the rage, and if you did it right you created a magical flow of seeming endless leads for your clients. Now, targeted ads, responsive design, and robust inbound strategies are simply costs of playing the game. Agencies are constantly being asked how they can do more for their clients. This report will provide you with a better understanding of the various shifts happening across the agency landscape. Let it help inform your strategy and execution. It doesn’t look like it’ll get easier any time soon. Digital spending should continue to grow 10-15% Y/Y through 2021. Video is the fastest growing segment. Agencies are facing multiple challenging market shifts that are impeding growth and margin expansion. 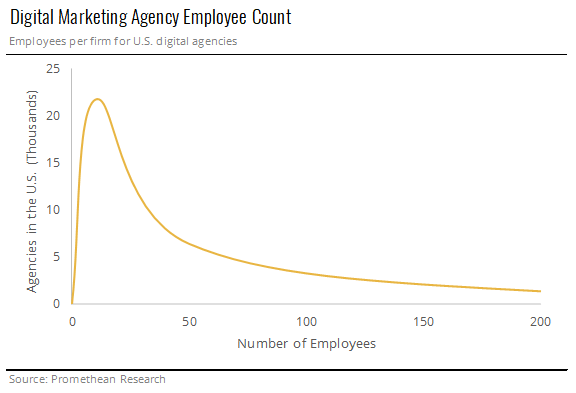 ~90% of agencies have fewer than 50 employees. Most agencies generate 10-15% net margins. Agencies are overly reliant on referral-based lead generation. Agency competition has grown dramatically in recent years and we expect it to continue throughout the next 3-5 years. This increase in competition is due in large part to a few key shifts in the industry. The first is that brands are adding marketing talent and they’re developing their own internal capabilities. 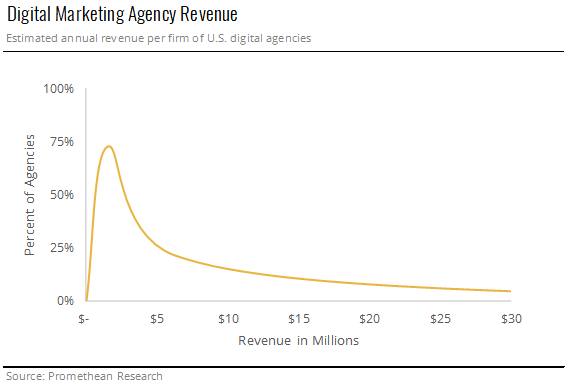 This is putting pressure on agency revenue as multiple services are becoming redundant. Second, there has been a shift from companies accepting retainer billing to project-based billing. This shift has made agency’s revenue profiles riskier as brands shop projects around to more agencies than they have historically. Third, the days of just being present in the marketplace being enough to build a business are coming to an end. Brands are demanding specialists and as technological prowess becomes an even greater differentiator, we’re seeing the market shake out the less capable agencies. Fourth, the large management consultancies are moving into the CMO suite. They already dominate the rest of the C-suite and they’re throwing their weight into marketing. They’re accomplishing this though strategic acquisitions and a number of large brands have already begun using them for their agency needs. The agency world isn’t all doom and gloom though. The turbulence in the marketplace is providing opportunities for well differentiated agencies to take significant market share. We expect to see the industry consolidate somewhat from where it is now as technological barriers to entry grow. Digital agencies operate in a highly fragmented market. This is due to few barriers to entry. Almost anyone can spin up an agency in a few months. Outside of the large agency networks like WPP, Publicis Group, Dentsu Inc, Interpublic, and Omnicom Group, the digital marketing industry is highly fragmented. Over 2/3rds of agencies are firms of less than 10 employees. About 1/5th have between 11 and 50 employees. Combining these shows that around 90% of digital agencies have fewer than 50 employees. The large firms (>150 employees) in this industry are comprised of agency holding companies. These are firms who own multiple smaller independent agencies that specialize across different focus areas. These allow the holding companies to work with many clients who could be competitors by distributing them across their network of agencies. This lets the holding company avoid any conflicts of interest while still providing a diverse set of creative solutions. The small and medium sized firms (<50 and 51-150 employee firms) are typically single agencies who can offer more services as they become larger with respect to revenue. The smaller agencies tend to be specialty shops, while the medium sized firms tend to be more full-service. A continued shift to digital spend provides a boost to top line growth. Acquisition opportunities can aid growth and round out service offerings. Exit opportunities and multiples are healthy. Inhousing is putting pressure on agencies to differentiate and deliver. A shift from retainers to projects is making revenue more unpredictable. New consulting entrants are attacking the upper end of the marketplace. Talent retention and acquisition remain a challenge. Brands demand a transparent ROI. Digital agencies are driven by the needs of individual brands. At large organizations brand strategy will be directed by CMOs and their VPs. At smaller firms the brand strategy will be directed by other C-level executives, typically directly by CEOs or sales executives. These needs have evolved as various industries become more competitive. 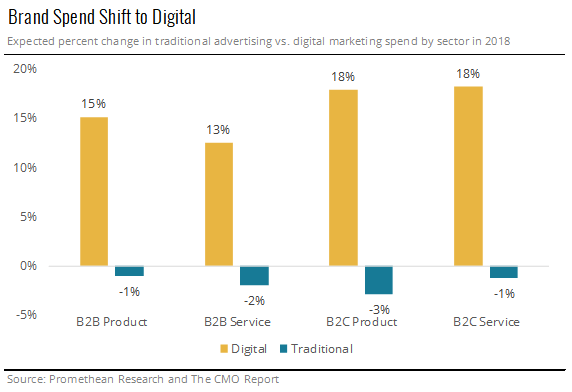 The clearest driver has been the move away from traditional advertising spending towards spending on digital marketing. Across the board, brands are spending a larger percentage of their budgets on digital marketing activities. 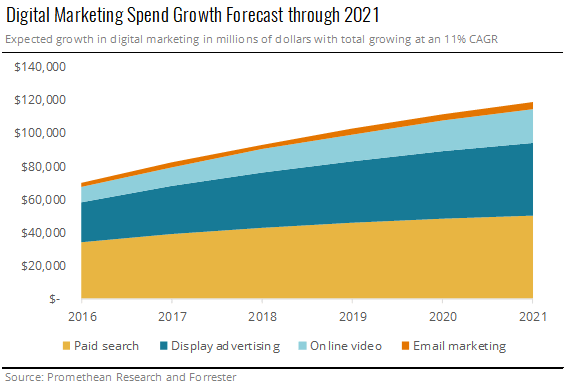 Digital marketing spend is expected to grow at an 11% CAGR from 2016-2021. Paid search and email marketing are expected to grow the slowest at 8% CAGRs while display advertising and online video grow the quickest at 13% and 18% CAGRs respectively. The percent of CMO’s budgets spent on digital marketing is expected to grow from the low 40%s to the high 40%s by the end of 2021. This rising tide provides a strong tailwind to agencies. The fragmentation and the high employee turnover in the digital agency industry leads to some key opportunities. These stem from the fact that best practices aren’t easily created or discriminated throughout the industry. The lack of industry cohesion allows an organization to significantly outperform its peers by simply implementing key operational improvements. With average net profit margins in the 10-15% range, and top end net margins in the 15-25% range, agencies can quickly generate strong cash flows. These cash flows are often split between reinvestment and shareholder distributions, but a strong case can be made for strategic acquisitions. Brands today are demanding deep technical prowess from their agencies. One way to build out a suite of services is through tuck-in acquisitions. Some agencies are being built to sell which is a viable option in today’s market. A well-positioned agency (strong historical and projects growth of >20% and historical and projected EBITDA of >20%) can command strong multiples. Large advertising agency groups are purchasing smaller ones for geographic and capability growth while management consultancies are purchasing agencies to expand their service offerings into the CMO suite. CMOs are constantly working to strike a balance between their internal capabilities and the value they gain from agency help. Lately, brands seem to be placing a greater emphasis on building their internal talent pools which is placing downward pressure on agency growth. The best evidence for this can be seen from the world’s largest ad spender, Procter & Gamble, slashing agency and production spending in early 2018 along with making forward-looking comments about reducing agency spend further. The company has already cut the number of entities it works with by ~60%. The in-house agency capabilities are also expanding. The top two things being handled in-house are social media management and basic design work. 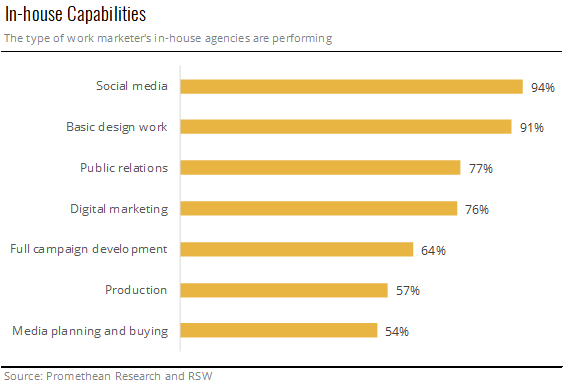 Three-quarters of in-house agencies handle public relations and digital marketing, while a little over half handle campaign development, production, and media planning. A secondary challenge arising from greater in-housing is a push-out of payment terms. As brands build their in-house capabilities, they’re less reliant on agency talent. This shifts the bargaining power further towards the brands. Because of this, the large ones are demanding extended payment terms with some agencies seeing 2-3x increases. Again, using Proctor & Gamble as an example, they are pushing out payment terms from the standard 30 days to 75 days. Shifting the cash flow burden to agencies themselves. As brands bring more marketing activities in house, they are also shifting further away from retainer-based billing. The days of each large brand having an established agency of record have faded. With this comes an increasingly competitive landscape as individual projects are being shopped to more and more agencies. This shift is increasing the risk profile of agency’s revenue mix. This makes it more difficult to budget and plan growth as revenue streams are less reliable than before. We are seeing some success with a simple terminology change, from “retainer” to “subscription” but this involves productizing the agency’s services. Note also that this strategy has only been tested on smaller clients and we would expect limited success with larger brands. The digital marketing agency world is a highly fragmented marketplace. We estimate that over 70% of the marketplace is made up of firms that generate less than $1.5M per year. First, there are very low barriers to entry to set up a digital marketing firm. The demand for specialists ensures that top-tier talent will always have the option of setting out on their own. This option, coupled with the challenging working environment at many agencies, makes “working for yourself” and attractive option to many. Secondly, M&A activity in this industry has remained steady over the last few years. We believe that this is due in part to the third force, limited benefits to scale. 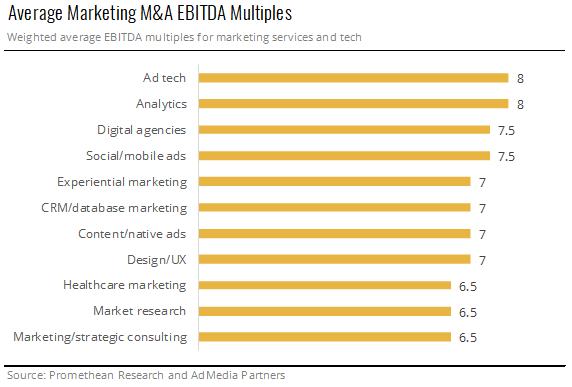 M&A in this industry tends to favor strategic capability additions rather than scale benefits. Finally, there are limited benefits to scale for the digital marketer. After an early point, cost reduction opportunities become negligible and the perception of working with a large monolith can actually be seen as a negative by brands. Low employee tenure numbers also play a factor in lower retained corporate knowledge. It is difficult to benefit from employee learnings when they aren’t around long enough to pass them along to others. The significant new entrants in the space over the last 10 years have come from the large consulting players. 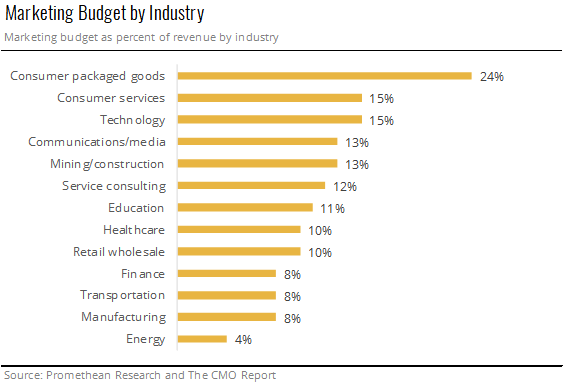 These firms already have deep ties into the CFOs, the CTOs, and the COOs and now they’re expanding their business into the CMOs budgets. The consulting firms are entering the agency space primarily through strategic acquisitions of both general agencies and small specialized shops. Agencies life is typically characterized as “work hard play hard” but if you ask the average employee, they’ll say it leans more towards the former than the latter. This, along with average agency salaries just above the U.S. median salaries, makes employee retention a challenge. Some shops have moved to the “churn-n-burn” approach which has serious negative long-term consequences. Talent acquisition is a difficult challenge as evidenced by the consistently large number of job openings at U.S. agencies. The high industry fragmentation makes building a good reputation difficult which in turn makes it harder to attract applicants. Once they are attracted though, work-life balance, compensation packages, promotion potential, etc. all play a part in the ability of an agency to secure a candidate. Unfortunately, at a large number of agencies, these are not robust enough and work against the firm during the hiring process. After seeing rising budgets over the last few years, stakeholders are demanding quantifiable results from their investments. CMOs in turn look to their agencies to provide them with transparent ROI calculations. Even with all of the tracking technology that has been developed, this has only become somewhat easier due to ad-noshows, bot views, and poor view confirmations. Brands believe they are often more adept at building ROI tracking internally and this is contributing to the inhousing referenced above. Agencies can work with anyone, but some industries are growing their marketing spend faster than others. Consumer packaged goods far outspends others but energy is one of the fastest growing. The blessing and the curse of today’s digital agencies is that essentially every kind of business can be a client. From small mom and pop shops to large multinational corporations. From packaged goods manufacturers to tech startups, to educational institutions. In this section we take a high-level view of the end markets agencies sell their services to. The vast majority of the marketing spend is controlled by Chief Marketing Officers at large brands. Their budgets tend to fall in the 10-15% of revenue range and they are impacted by multiple forces from within the organization. Over the last few years, roughly 2/3 of their marketing spend has been focused on existing customers (growth and retention) with 1/3 being spent on new customer acquisition. Most firms employ a combination of multiple pricing strategies. Value-based pricing seems to be the holy grail of pricing methods, but it’s often the most difficult to implement. Agencies price their services a few different ways. The most common is a blended approach which encompasses a mixture of the other types. 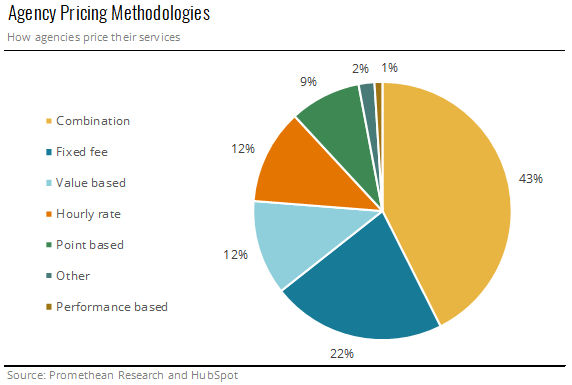 After a blended approach, the most common way to price services is with a fixed fee structure. This model is employed by estimating the cost of a project and then adding a margin to arrive at a fixed fee the client will pay. This type of model includes retainer-based billing along with progress-based billing. This model works best with clients who have a set budget they’re unable to exceed and need to know project costs beforehand. Both parties assume risk with these types of arrangements though as cost overruns are absorbed by the agencies while cost savings aren’t typically passed to the client. Fixed-fee models also may limit agency revenue growth as the option to add additional services typically isn’t available until the contract renewal time. Pricing services based on the value an agency’s work generates for a client appears to be the goal for most agencies as it more aligns the agency’s and client’s goals than the fixed-fee model and can generate substantial profits for the agency. Agencies typically experience pushback when selling this model though as value-based prices can be much higher than cost-plus pricing. This model is best employed by experienced, proven agencies that can point to successes to help clients understand the return on investment. This is the simplest pricing model and is often employed by firms in their early stages. Here agencies price their services based on the costs and time required to perform those services and then bill on a periodic basis based on the time incurred. There can be a blended “firm-wide” hourly rate charged, or different rates based on the skill level of the individuals working on the project. The hourly rate model has the potential to incentivize inefficient practices and can misalign the agency’s incentives from the client’s. A number of industry leaders advise against this model for these reasons. This model is essentially a blend of the hourly rate, value, and fixed fee models that were described above. Here a client agrees to purchase a set number of “points” each month that they can then allocate to a menu of marketing services throughout that month. E.g. a blog post could be worth 2 points. Points have fixed prices that agencies determine by taking into account the amount of time and costs associated with delivering various marketing services. An agency will therefore have different margins based on the distribution of points. 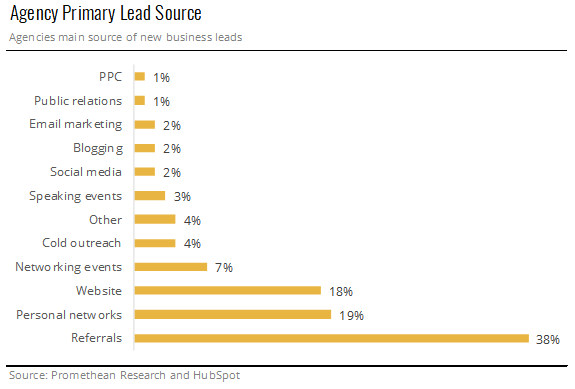 Most agencies are overly reliant on referral-based lead generation. The average billing rate is $150-175 per hour. Specialist agencies tend to command a higher hourly rate. Digital agencies are realizing that relying primarily on referrals is a risky way to grow. Over the past few years more agencies have employed new business representatives. A key challenge that agencies are facing with this trend is how to properly build out an effective sales team. Hiring a few sales professionals without the proper infrastructure and training typically ends in frustrated parties on both sides. Even with the trend towards building out sales teams, agencies still derive over half of their new leads from personal networks and referrals. This can be a growth limiter though as referrals and personal networks are primarily comprised of individuals with similarly sized businesses. Therefore, new referrals are very likely to be similar to your current client base. This makes it difficult to attract larger clients than you currently work with. 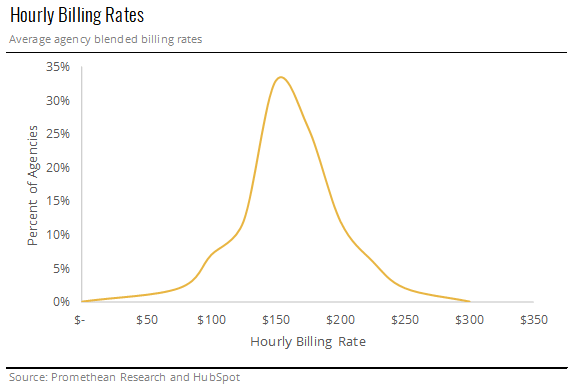 The majority of blended agency billing rates fall in the $150-175 per hour range. However, our research has shown that these vary widely based on the location of the agency, the types and sizes of clients served, and the types of projects worked on. Smaller market, generalist agencies tend to operate on lower billing rates while larger market, specialist agencies tend to command higher hourly billing rates. 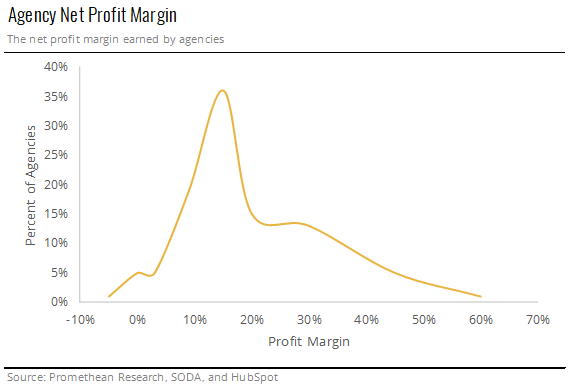 The average agency has a 10-15% net profit margin. Agency margins are influenced by numerous business levers. The most impactful is often the billing rate. The average agency margin is clustered closely around 15%. Similar to the billing rate, this is heavily influenced by the location of the agency, the types and sizes of clients served, and the types of projects worked on. In addition to those factors, the agency’s cost basis (primarily employee costs) will have an effect on margins. Agencies with employees located in higher cost of living locations will have a higher cost basis than those in lower cost of living locations. This is typically rectified by altering the agency’s hourly billing rate. How Can We Help Grow Your Agency? The agency world is full of twists and turns and it will only become more complicated. The market is now forcing agency owners to manage their businesses more diligently while having a broader understanding of the marketplace. The days of comfortable growth are gone. You’re now facing a new breed of competitor. The coming years will be challenging but this market turbulence is providing numerous opportunities to succeed.